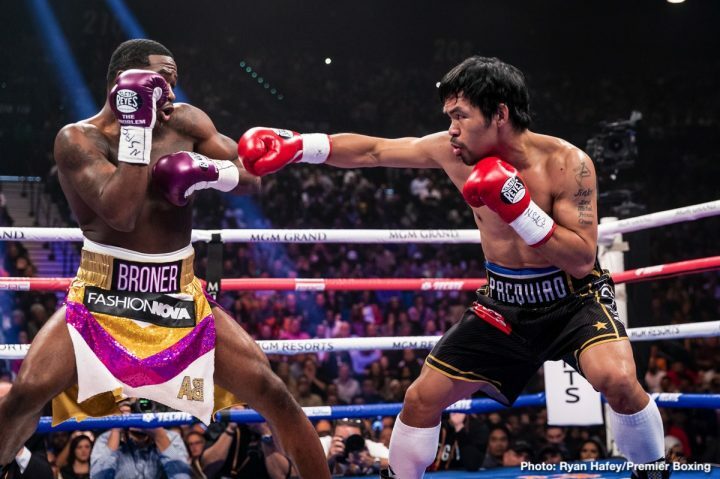 By Chris Williams: Manny Pacquiao’s fight against Adrien broner last weekend drew 400,000 pay-per-view buys, according to Yahoo Sports News, which makes the fight one of the most successful for the Filipino star since his ‘Fight of the Century’ against Floyd Mayweather Jr. four years ago in 2015. Pacquiao’s guaranteed purse for the fight was $10 million to Broner’s $2.5 million. The fight had been predicted to bring in 325,000 to 350,000 buys. For it to hit 400,000 is excellent news for Pacquiao, and for Broner as well. The 400,000 buys Pacquiao-Broner brought in last Saturday were much better numbers than Pacquiao’s last PPV fight against Jessie Vargas in 2016, which brought in only 300,000 buys. Vargas lacked the charisma and the career accomplishments that Broner possessed in order to help Pacquiao attract interest in their fight. Vargas was a two division world champion, but he’d never looked like a solid top level fighter. Pacquiao brought in the PPV numbers for the fight without much help, as Broner’s career has tanked badly since 2016, and he’s become a B-side opponent for the top guys. Pacquiao likely would have brought in much higher numbers if he had faced one of the relevant fighters in the welterweight division like Errol Spence Jr. or Keith Thurman. Pacquiao’s fight with Jeff Horn in 2017 wasn’t on PPV in the States, which is understandable because boxing fans in the U.S weren’t familiar with him at the time the fight took place. But now that Pacquiao is with Premier Boxing Champions, he’s off to a good start with the 400,000 buys he helped bring in for his fight with Broner (33-4-1, 24 KOs) last weekend on SHOWTIME PPV at the MGM Grand in Las Vegas, Nevada. Pacquiao beat the 29-year-old Broner by a 12 round unanimous decision by the scores 117-111, 116-112 and 116-112. The PPV numbers Pacquiao brought in for the Broner fight shows that he’s still one of the top draws in boxing, and more than popular enough to continue to make good money even if Floyd Mayweather Jr. chooses to never face him again. Pacquiao is #2 behind Mayweather as the greatest PPV fighter in the history of boxing. His fight with Mayweather brought in 4.6 million PPV buys in 2015, with a massive revenue gross of $600 million. Pacquiao-Broner brought in an estimated $30 million. With the win over Broner now behind him, Pacquiao told the media in the Philippines that he hopes to hear something from Mayweather for a fight between them. If not, Pacquiao will be back inside the ring in April or May for his next fight with Premier Boxing Champions. However, it’s unlikely Pacquiao will face the winner of the March 16 fight between IBF welterweight champion Errol Spence Jr. and Mikey Garcia. It’ll be too fast of a turnaround for the winner of the Spence-Garcia fight to get back inside the ring to fight Pacquiao in April or May. A better option for Pacquiao is to face WBA Super World welterweight champion Keith ‘One Time’ Thurman (28-0, 22 KOs) in April or May, as long as he wins his fight this Saturday night against Josesito Lopez.